Movie Review - 'Source Code' - Save The World Or Die Trying (Repeat As Needed) A soldier must relive the last minutes of another man's life — repeatedly — to stop the terrorist who killed him, and who looks likely to strike again. A man. A space station. A possibly diabolical computer named GERTY. That's all first-time director Duncan Jones needed to create the brainy science fiction of Moon, a model of jury-rigged resourcefulness on an exceedingly modest budget. The man was a three-year contract worker, his only job to send shipments of an energy source called helium-3 back to Earth. The space station was spare and lonely, a rundown version of the antiseptic white spaces in movies like THX 1138. And GERTY, a cold companion of the HAL 9000 school, had allegiances to a mission more insistent than its master's wishes. Jones' follow-up, Source Code, will draw many comparisons to Groundhog Day with its story of a military man who must relive the same eight minutes on a loop until he gets it right. But stripped down to its most basic components, Source Code is essentially Moon revisited: a man, a capsule, a program serving a higher purpose than the fate of its chief operator. Only this time, Jones has more money and greater studio expectations behind him, so what begins as another existential head trip that puts ideas before spectacle eventually morphs into something trite and compromised — hard sci-fi gone soft. In the early going, Source Code connects effectively with the disorientation of a soldier who doesn't know where he is or even who he is, much less what his mission is supposed to be. 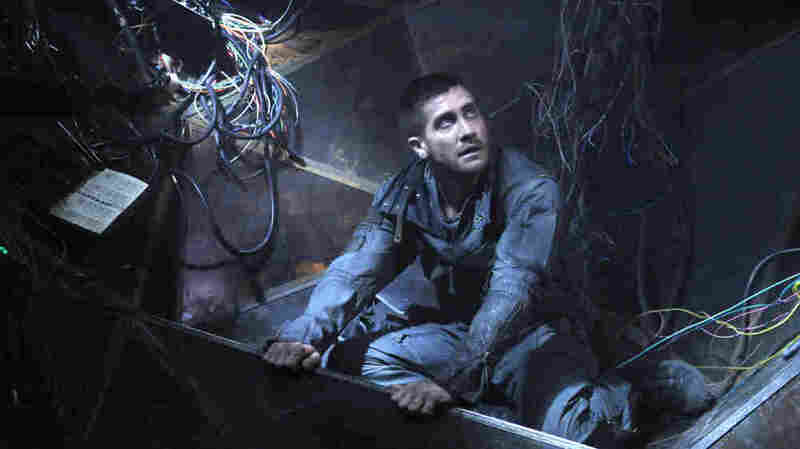 Played by the puppy-eyed Jake Gyllenhaal, the last thing he remembers is flying a helicopter in Afghanistan; now he's on a commuter train to Chicago, sitting across from a friend he doesn't know and eight minutes away from being blown to smithereens. When he comes to after the explosion, he's in a crude metal capsule, taking orders from a woman on a monitor who wants to send him back to relive those eight minutes until he discovers the bomb's location and the identity of its creator. Working from Ben Ripley's script, Jones slowly brings the details of Gyllenhaal's situation into focus. Though his real name is Capt. Colter Stevens, Gyllenhaal spends the eight minutes on the train wired into the conscience of one of the bombing victims. The victim's confused friend is Christina, played by the ebullient Michelle Monaghan, and the woman on the monitor is Goodwin (Vera Farmiga), who acts as Colter's guide through his extraordinarily stressful ordeal. He's a man with a chance to save lives by identifying a terrorist before he kills again. But he is still stuck on a loop, no matter how hard he himself tries to live past his allotted time. Forced to relive that harrowing eight minutes over and over in the search for bomb and bomber, Stevens falls in love with Christina (Michelle Monaghan), a passenger who dies each time in the explosion. The more confusing Source Code remains, the better it is. Jones and Ripley align the audience closely with their hero, withholding revelations until he discovers them himself. His trauma has the greatest possible impact that way: Not only is this man doomed to relive the same patch of time over and over again, but every eight-minute cycle ends with an explosion that kills every passenger — and that he can't stop. And it only gets worse as he gets to know Christina and learns more about the various commuters whose heads are otherwise buried in books and laptops. Yet as Colter starts to stray from his mission and find some way to alter his fate, the rules that govern Source Code break down — and the film breaks down with it. The difference between Bill Murray's situation in Groundhog Day and Gyllenhaal's situation here is that the Groundhog Day curse is the universe's way of telling a self-serving, egotistical weatherman to become a better person. Source Code is a piece of science fiction, and while the technology that sends Gyllenhaal back to the same eight minutes may be gimmicky and ludicrous, the logic behind it needs to be consistent. The last 10 or 15 minutes of Source Code feel like bad studio notes followed to the letter, with all that careful, rigorous sci-fi world-building tossed out and replaced by another lame paean to the transcendent power of free will. (See also: The Adjustment Bureau.) Based on its thrillingly fractured first half — not to mention Moon in its entirety — Jones seems much smarter than he allows the film to be in the end. It wriggles out of its own intriguing puzzle.